Mixing stripes with plaids used to be a no-no...sort of like wearing white after Labor Day. But just as fashion rules have relaxed, so too have home decorating do’s and don’ts. Mixing patterns is chic! Still, there are some guidelines for decorating with mixed patterns. Do it well, and you add terrific visual interest to your space. Do it without thought, and the results can be overly busy and distracting. 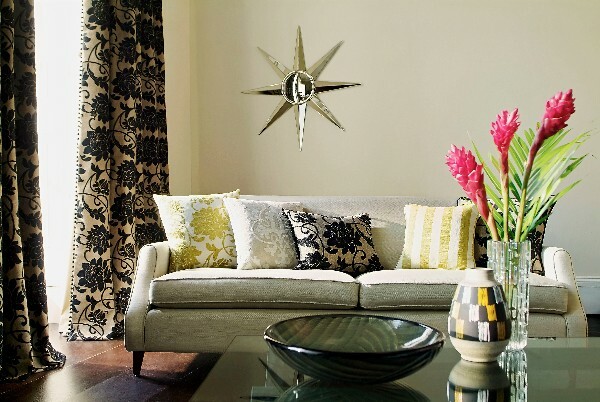 Here are some tips for decorating with mixed patterns. The “Rule of Three” is a principle used in many aspects of decorating. There is just something visually pleasing about groupings of odd numbers, especially when you’re trying to avoid looking “matchy.” Three is the minimum number of patterns you should use—you can use more, but with each addition, take care that the combination doesn’t become too busy. Choose the largest scale pattern first as the anchor, then choose the other two to complement it. Try a 60/30/10 ratio. Go with 60% of your main pattern, 30% of a second pattern, and 10% of a third pattern as an accent. If you’re using an extremely bold or splashy print for your main pattern, make the others more low-key so the combination won’t be too busy. Think about the scale of the patterns as well as the shapes in order to create interest. You might mix a large floral pattern with a narrow stripe and a midsized check. Choose patterns that are obviously different from one another, like a floral with plaid and paisley with stripes. This makes the combination look thoughtful and intentional. Shared colors make contrasting patterns look as though they belong together. Look for subtle accent colors in one pattern and bring them forward in another. When choosing your patterns, stay within the same color intensity. Mixing a soft pastel floral with a bright primary color stripe or jewel-toned damask print will look jarring. The eye, that is. Your patterns will “pop” when the eye has a place to rest, such as a neutral colored wall or solid colored upholstery. Balance out your prints with solid colors. Otherwise, the area may look too busy, and the patterns will lose their effectiveness. As you consider the prints you’d like to add, remember that your room may already contain patterns. Is there a bold striped pattern in the hardwood floor? How about a geometric pattern in the tile? Striped wainscoting? Take these into account when you’re creating your mix. Decorative pillows are an inexpensive way to dip your toe into the pattern-mixing pool without diving into a complete room redo. Use them to add fresh visual interest to your living room. For the bedroom, many bedding sets do the pattern mixing for you by using complementary prints on a reversible comforter or in the pillow shams. Follow us on Facebook for decorating ideas, decor trends, and the latest Wichita Furniture deals. Want help finding the perfect decor and furnishings for your space? Stop into our store or use our online chat feature—we’re here to help.